When I sat down with Le Trou (The Hole) I only intended to watch a small portion of it at the moment since I didn't really have the time to go through the whole thing in one sitting. After about 20 minutes, I decided to make the time. I was completely drawn in and absorbed in the story, virtually on the edge of my seat wondering what would happen next, and by the conclusion, I felt exhausted. I guess that's a good thing when it comes to movies, and few prison films have this kind of edge to them. While I've always thought of the 1979 Clint Eastwood classic, Escape From Alcatraz, as one of the best escape flicks ever made, I think Le Trou (having seen it for the first time) edges it out to a close second. 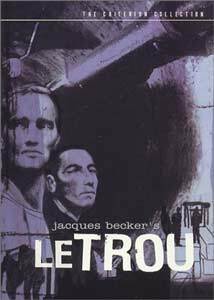 Filmed in 1960, Le Trou tells the true-life story of 5 inmates in a Paris prison who concoct a complex, brilliant, and ambitious escape plan. Despite how impossible it seems, they intend to tunnel out of their cell, into the prison basement, and then escape through the sewer, all under the noses of a strict guard system and thorough cell shakedowns. As the story begins, young Gaspard (Mark Michel) is being transferred into a new cell when his old one needs major repairs. Even though the new cell already has 4 inmates, the guards don't hesitate making it an uncomfortable 5. Gaspard is in luck, though, as the 4 men are extremely friendly and honorable. They hide an interesting secret, however, and that is their plot to escape. They risk a possible complication by telling Gaspard, but they decide to make him part of the plan since they trust him. So, bit by bit, the men manage to put together a clever plan where they will use the loud noises of the prison repair operation as a cover for their initial digging, then get jobs making cardboard boxes so that the mess from making them will cover up some of their work. Using bits and pieces of common things found in their cell, they manage to fashion a few crude tools, and the genius of the operation, Roland (Jean Keraudy), is even expert at imitating prison keys with pieces of raw metal and a simple file. They adhere to a fast, accelerated time frame, knowing that they maybe have a week or so to work before their cell is given a complete check. Through all this tension, they stick together, but will their elaborate plan really succeed? While the story itself is interesting on its own, undoubtedly Jacques Becker's direction is the primary factor in the beauty of the film. The majority of the scenes take place in a prison cell, small and packed with 5 men; an unforgiving and daunting task for a director if he wants to avoid boredom in the audience. Yet he uses stylish camera angles and a razor sharp script to keep the drama and emotion between the men so interesting that there's no time to get bored. One technique I noticed iwas Becker's use of extremely long takes, much longer than you usually see in an average film, and it works brilliantly. For example, the scene in which the inmates first decide to dare hammering through the floor is done in one relentless take. The actors are actually digging through concrete and dirt; there are no special effects or trick walls, they're REALLY doing the work, and all in one unflinching shot. The length of the scene works, though, because you feel just as tense as they do. Will someone hear them? Will the noise attract the whole prison? They have no choice, though, and must proceed. Other lengthy shots, scattered throughout, serve the same purpose: to enforce the notion that you're living through the agonizing, time consuming work as they are. The characterizations of the men are superbly handled as well. Cast from a pool of unknowns (including one fellow who was one of the actual escapees that the story is based on), each character is given a distinct way of behavior that immediately sets up who they are with little to no exposition. A lot of similar prison escape films use a lot of time to set things up, but Le Trou is fascinatingly structured so that the audience has to take some of the perspective of Gaspard, the newbie. The other 4 already have their ideas and plans organized, so we don't actually see things leading up to that point. Instead, almost the entire movie is strictly focused on the escape attempt itself. Another element worth mentioning is the almost complete lack of a musical score. Only stillness and silence fill the air, until it is broken by the inmates hammering on rocks or filing bars away. Since being heard is one of their chief dangers, letting you experience it just as they would (without dramatic score) is a clever touch. In the end, Le Trou is a superb suspense film with an equal amount of effective human drama. It almost begs the question of whether or not a man who works so hard truly does deserve his freedom, regardless of his crime. Is perhaps the stress and mental anguish of the attempt enough punishment? If there is a message here, perhaps it is how the ingenuity of the human spirit simply cannot be choked off, even in a decaying, crumbling prison of forgotten souls. Image Transfer Review: Framed at 1:66:1 with anamorphic enhancement, the black & white image is amazingly clean and finely detailed for a 1960 film. While there is some evidence of age damage (a few scratches and negative splotches), it is extremely minor and not distracting; the biggest visual flaws are the extremely large, obvious, reel change markers. Although the case claims this as an RSDL disc, I was unable to detect any layer change, so it must have been well hidden. In any case, fine grain details are easily visible and the balance between lightness and black level is finely held. Even the dark, shadowy sequences are clearly visible, with all the gloomy and purposeful lighting schemes preserved in all their glory. There was no shimmering or movement in the bland background textures, even in the most challenging segments. Running at an average of 8-10mbps bitrate, the image is free of compression artifacts and other noticeable digital flaws. Audio Transfer Review: For a single-channel mono track, the audio manages to be extremely moving. The majority of the film is filled with uncomfortable silences penetrated by loud, brash noises like the clank of steel on cement or the moody drip of water in a musty sewer. All of this comes across very easily and clearly. At times, the louder moments can sound a bit flat and harsh given the lack of any bass extension or stereo effects, but for such an old, minimalistic soundtrack, the audio is superbly clean and without hiss. Excerpts from the 1964 U.S. Pressbook. Extras Review: While there no direct supplements, the impressive keepcase booklet contains excerpts from the original 1964 U.S. pressbook from when the film was released here. These notes are accompanied by a short essay on the career of director Jacques Becker written by Chris Fujiwara. The booklet itself is a wonderful work of art with one entire, fold-out side dedicated to DVD production credits, presented with stylish paintings and drawings based on the film. In a clever move, all of the chapter titles end in '-ing' (Scolding, Meeting, Receiving, etc.). The English subtitles are white with black borders and use a very nice, smaller-than-normal font. Color adjustment bars are available on chapter 19, after the film. Le Trou is a masterpiece; a clever examination, not only of an attempt prison escape, but of the men involved as well. It questions loyalty and devotion, but mixes those themes with pure tension in a seamless mix. Director Jacques Becker died two weeks after the completion of the film, but even if this was his only film, it would be, and is, an impressive legacy.